After watching the We will rock you Arena Tour two weeks ago I decided to check out the German production for the first time in 8 years. The show is currently doing a limited run at the Colosseum Theater in Essen and is once again performed with German dialogues and a mix of German an English songs. I admit I have never been a fan of the German version of the show which is why I stopped watching it back in 2005 during the original run in Cologne. First of all We will rock you has a completely random plot anyway. But to translate this plot and add some kind of “English is the forbidden language” storyline has always struck me as rather ridiculous. I mean, why would the leader of such a planet have the not so German name Killerqueen? It just doesn’t make sense at all. And while I realise it is essential to make sure the audience understands what is being said on stage the German dialogues are quite simply appalling in places. They make me cringe. However, I was aware of that and decided to concentrate on the music because after all this is still Queen and Queen does rock! First of all the show was experiencing technical difficulties – things like that happen but it would have been a good move to inform the audience before the start of the performance. There were no video screens throughout the entire show which means whenever Killerqueen or Khashoggi were supposed to be on those screens you just heard a mysterious voice from off stage. One Vision was performs in front of a black curtain. There was no statue of Freddie Mercury emerging from the water so the audience was left wondering what everyone on stage was so excited to “see”. Without the screens the whole show just looked like a rather cheap touring production. But in the end I was there to listen to great music so I concentrated on that. I’ll start with my personal highlight: Jeannine Wacker as Scaramouche. That girl has quite the voice! I’ve always thought Scaramouche wasn’t very likable in the German production and that hasn’t changed (because yes, there is a difference between being feisty and acting downright bitchy). But Jeannine’s Somebody to love won me over straight away. What a fantastic rendition of such a belter of a song! She does well on the acting side – the fact that I don’t like the character as a whole isn’t her fault after all. Christopher Brose is Galileo and I’m afraid to say I don’t know how to describe his performance without sounding rude. He has a nice voice – which sadly isn’t suited to a lot of the songs in the show. He’s quite clearly a classical musical theatre singer. His voice is missing a rock edge and he seems to struggle with several of the higher notes. He looks weirdly out of place during the show. It almost looks like he hasn’t got a clue why he is in this show. His “I want to break free” seems almost bored – there is no energy at all. He improves throughout the show but he never loses that “What the heck am I doing here”? vibe. Martin Berger’s Khashoggi is solid and he does well with the material he has been given. The same goes for Goele De Raedt’s Killerqueen although someone needs to tell her that trying to look extra evil the whole time might come across a bit funny after a while. I’d love to see her let go of that extremely musical theatre voice and put on more of a rock voice (because lets face it, singing Queen in “Les Miserables” style just doesn’t sound that cool). Walesca Frank plays Ozzy and whilst her performance isn’t bad I was missing a certain sparkle. Her voice is rather weak compared to others I have seen in the part and both her and Markus Neugebauer (Brit) lack energy on stage. To me Markus appears to be almost embarrassed of the material he is working with – I can’t blame him to be honest because Britney Spears really has lot all dignity the character has ever had. It’s a shame to see this role being turned into such a laughing-stock. This, of course, isn’t Markus Neugebauer’s fault. Leon van Leeuwenberg’s Bap is likable and entertaining. His performance is another small highlight in an all in all average show. This was the first time I ended up watching We will rock you and just wanting it to end. I couldn’t connect with the cast on stage. As a whole they lacked stage chemistry and I caught myself thinking “Do they actually want to be up there?” several times. It’s a shame because usually We will rock you is a show full of energy and you can see how much the people on stage enjoy singing those iconic songs. Safe to say I won’t make a return visit. But as always I suggest you make up your own mind. 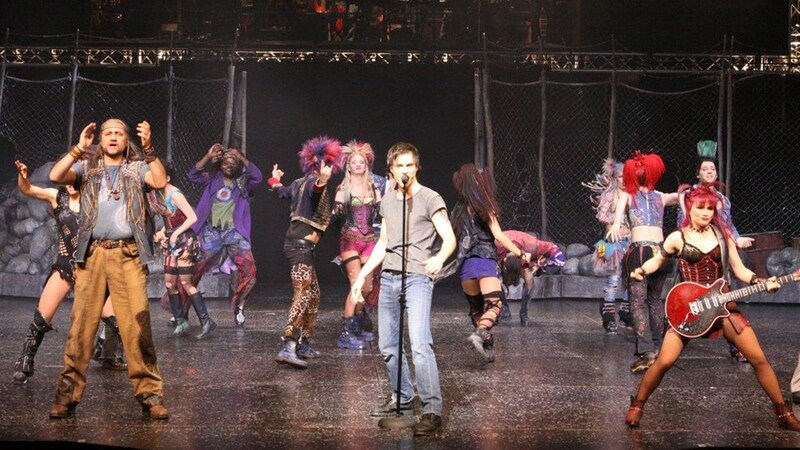 We will rock you is running in Essen until the end of June. 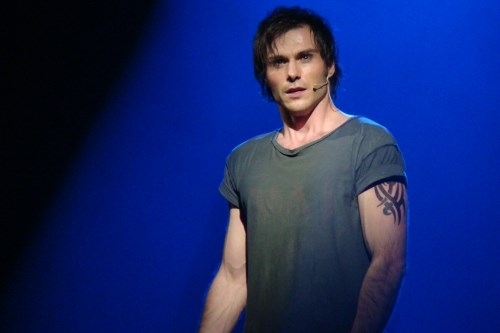 For more info and to book tickets go to http://www.wewillrockyou.de/. I’ll be seeing it one more time with Alex and Vera on May 26… Hope my sense of nostalgia will be enough to enjoy it. I am sorry that this was a boring show for U! wasn’t a good day for Chris. Christopher has a great power in his voice, u should give him a second chance. Goel is a terrible Killer Queen! U should listen to Brigitte Oelke. I won’t be making a return visit. I’ve seen Brigitte’s Killerqueen years ago. She’s good (I’m not a fan of the German version of the part). But Killerqueen will always be Mazz Murray (London) for me.